Expect to find nail art inspiration, hand-painted designs, reviews and more. + Beauty items & review! "It's all fun & games until someone breaks a nail!" Are you ready for another amazing summer abstract nail art design?!?! well as the holographic silver glitter. of all of the items I used to get this nail art look!!!!!!!! I think these design is awesome! Please let me know if you give this nail art design a try! Leave a comment below with your thoughts and opinions! Stay tuned for future posts and cool nail art ideas! For the LOVE of everything nails! This a blog where women can be girly! :) On here you can find nail art inspiration for natural (long/short) nails, acrylic designs, hauls, polish swatches and much much more! This is a safe place! Feel free to leave comments, ask questions and interact with me! Hi there, my name is Anna but everyone calls me Red. I have been passionate about everything nail related for a few years now. 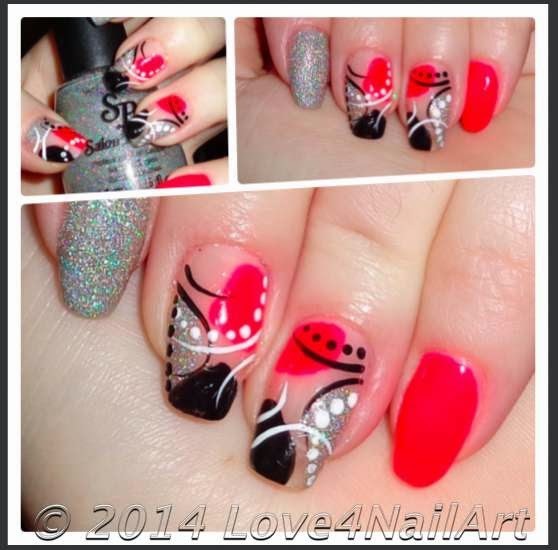 Along the way on my nail junkie journey I have blogged numerous design ideas, inspiration and reviews. I just would like to share my passion with the world and help inspire creativity in others. Plus beauty items, review & more. I hope you enjoy my blog!